My Mom is an incredible woman. She can make just about anything, whether cooking, baking, painting, sewing, or more. Plus she can hold her own out on the farm doing the dirty work. I inherited about half of that and quite frankly being just half the woman my mother is, is a pretty lucky thing. As a kid I remember making homemade play dough all the time with my Mom. We lived way out in the country, like hilly billy, back woods, distance. 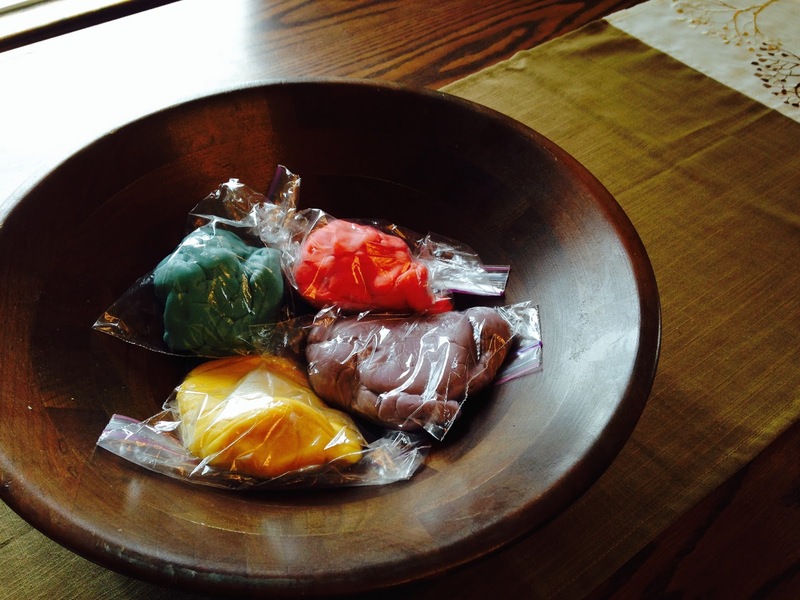 We didn't have the luxury of buying new play dough if we left the play dough out and it dried up. Instead, we made our own. I've always made play dough with my girls since they were teeny tiny as well. Today, I switched it up just a bit. I added scents! I used the same recipe my mom has used since we were kids, and when it came time to add the dye, I also added an essential oil to each of them. Now, lest you think that I am bragging, or running for Mom of the year, yesterday the two oldest spent several hours out in the cattle pen, literally up to their knees in spring time muck (poop with a little dirt tossed in) and came back covered head to toe in it. We most certainly do not spend everyday making sensory play things and holding hands and singing Kumbaya. But since I can't really share tips on how to let your children loose in manure and teach them to roll in it like small piglets, I will instead share my Mom's recipe for homemade play dough. Bring water to boil, add alum and oil. Separate into however many portions you want. I usually do four and add food dye in the color the kids want. 4-6 drops of food dye per dough ball. Then roll, squish, mix till desired color. If you want, add a couple drops of essential oil for a twist. It's that simple. Your kids will love it. The essential oil is completely optional, and since this is my first time, I have no idea if its worth it, or if I'll just end up nagging at the kids to not eat the play dough. It could be just a new temptation, but it can't be any worse than rolling in manure! Happy Monday friends, enjoy this Easter week. If you want tips on farm sensory play, find a mud hole, dirt pile, or manure pile. Then let your children loose, turn your back, and walk away. Come back at a later time, while unsupervised, they will have no doubt figured out how to rub all sorts of sensory items: disgusting-filthy-you-do-not-want-to-know-what-that-is-sensory items, in their hair, up their arms, and in the mouths. They will be grinning from ear to ear. Take them home, hose them down and put them in the bath. Repeat as necessary for quality sensory play.